11-12 medjool dates (1 cup packed), pitted and soaked for 5 minutes, drained. Line an 8×8 pan with parchment paper, or use a silicone square pan and place on baking sheet, set aside. You may also use 9×5 loaf pan, your base will just be thicker. Pour melted chocolate (I used microwave) over bars and spread evenly. 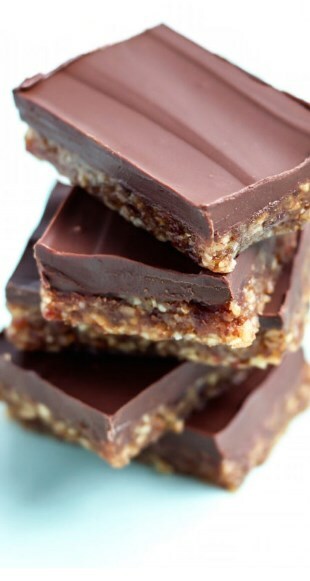 Place bars in freezer for 10 minutes to allow chocolate layer to set, or fridge for at least 20 minutes. Remove bars from pan and place on cutting mat for easier slicing. Using knife, gently slice into 24 bars. Enjoy! –Bars should be stored in fridge (or freezer for longer periods of time) but can come to room temperature before enjoying.